Purchase 890 x 800 pixel digital file by using the Buy Now buttons below. You will receive an email with the download link. You can use the link 5 times to download the digital file. 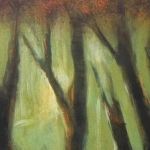 'Through the Trees' is an inviting 36 x 40 inch canvas by Abhijit Das. Ethereal and poetic, the red-hued grove of dark trees is lit up by a glow from beyond, lending a life and character to the sillhouettes. The allure is heightened by a sense of mystery in this interesting landscape..
New artwork uploaded. 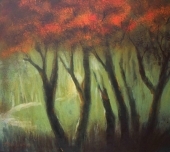 'Through the Trees' is an inviting 36 x 40 inch canvas by Abhijit Das. Ethereal and poetic, the red-hued grove of dark trees is lit up by a glow from beyond, lending a life and character to the sillhouettes. The allure is heightened by a sense of mystery in this interesting landscape. Abhijit Das was born on 12.02.1959. He passed B.V.A (in Western Style) from Government College of Art and Craft in 1989 and participated in National Exhibition Lalit Kala Academy 1991,1996.